On Sunday, September 21, 2014, Lisa Gunter, a PhD candidate in Behavioral Neuroscience from the Arizona State University Psychology Department, and Alexandra “Sasha” Protopopova, a PhD candidate in Behavioral Analysis from the University of Florida, visited CPT along with Peter Cook, PhD and Prof. Gregory Berns, PhD, MD from Emory University. Lisa, Sasha, Peter, and Greg worked in conjunction with CPT President and Head Trainer Mark Spivak to construct radial arm maze experiments on multiple dogs from the Emory-CPT Dog Project. The radial arm maze examines working memory, spatial memory, and spatial learning. The maze consists of 8 arms of equal length that spoke off a central hub. Food is placed at the end of each arm. The subject animal is then placed in the center and must continue the maze until navigating so that the animal eats all the food drops. The experimenters meanwhile measure time to completion and the number of errors, with an error defined as the animal returning to an empty arm. Kady immediately after eating a treat that she found at the end of one the 8 maze arms. She is now turning back toward the center of the maze. Working memory is the central nervous system operation of retaining and utilizing transitory information. The operation of working memory consists of cognitive processes, executive management, attention control, short-term memory, and the neural networks that facilitate integration, processing, disposal, and retrieval of information. Working memory allows an animal to use information to complete complex tasks. The primary brain sections involved in working memory include the frontal cortex, parietal cortex, anterior cingulate gyrus, and basal ganglia. Research has shown that in humans excellent working memory skills are associated with higher intelligence. Conversely, a lack of working memory ability is common to persons with ADHD. 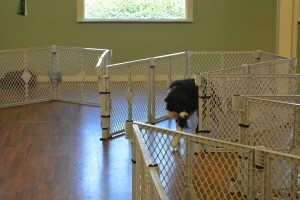 In the context of the radial arm maze, we examined the capacity of the dogs to adapt their brief preparatory training that taught them there is food available at the end of each arm and we examined the dogs’ abilities to develop an independent strategy for best achieving their objective of expeditiously acquiring each food reward, while also minimizing time via eliminating errors. Spatial memory is the operation of recording, retaining, and using information related to location, position, and orientation. Spatial memory incorporates visuals, other sensory information, landmarks, events, and associations that aid navigation. The spatial memory operation is a cognitive process that allows a human or animal to remember different locations and the spatial relationship between objects. For instance, a taxi driver or guide would need outstanding spatial memory to excel in his/her job. Poor spatial memory in humans is often associated with poor problem solving skills. Interestingly, sleep is very important to the consolidation and retention of spatial memory. Research demonstrated that NREM sleep positively affected human route retrieval and memory performance. Therefore, sleep is more effective than wakefulness in consolidating spatial memory. Furthermore, to optimize spatial memory, sleep must occur on the night proximal to the spatial exposure. In humans, the primary brain sections involved in spatial memory include the hippocampus, posterior parietal cortex, entorhinal cortex, prefrontal cortex, retrosplenial cortex, and perirhinal cortex. In the context of the radial arm maze, we examined the capacity of the dogs to: 1) understand directions (left, right, forward, rearward), 2) use reference points to remember where they were and where they needed to go relevant to specific arms of the maze, and 3) orient or re-orient themselves effectively once they returned to the center of the maze, where each of the 8 “spider arms” of the maze appeared identical, but where the landmarks proximal to the end of each arm differed slightly. The results of the maze runs were interesting. Overall, the calmer and more cognitive dogs completed the runs faster and with fewer errors- in one case zero errors. On the other hand, the more nervous dogs took longer to complete the runs and had a greater number of errors. The best two dogs developed an outstanding, efficient strategy of hugging the wall of each arm and moving only in a clockwise or counterclockwise direction whenever returning to the center of the maze. In contrast, the more nervous dogs did not plot a strategy. Rather, they randomly went to various arms in the hope of finding food. Some apparently incorporated minor spatial memory in remembering where they were previously. However, the slowest dogs never plotted a strategy and appeared too anxious to evaluate spatial information. Consequently, there was complete and utter randomness to their actions. Caylin, a calm and cognitive Border Collie, quickly formulated an efficient strategy of hugging the walls of the maze while progressing in a counterclockwise direction. Thus, our radial arm maze observations with dogs concurred with working and spatial memory research results with humans. In humans, there is a relationship between ADHD and inferior working memory. Similarly, with the dogs we observed a relationship between lack of focus and poor working memory, as indicated by the slower times and higher amount of errors. In humans poor spatial memory is correlated to poor problem solving. In our experiment, the dogs that best used landmark information available in the environment best solved the problem of finding the food quickly. Conversely, the dogs that appeared least aware of the environment did the worst at solving the food location problem. We will combine the working and spatial memory results of the radial maze with an experiment we are conducting within an fMRI scanner. The objective of combining the data is to evaluate whether there is consistency in the application of the dogs’ working and spatial memory or whether the dogs’ abilities are instead highly context dependent. In the fMRI scanner, the participating dogs must lay absolutely still within a chin rest. At the forward end of the chin rest we place two wooden “targets,” one a little ahead and to the left of the dog’s chin and the other ahead and to the right of the dog’s chin. While the dog is lying motionless, the handler will then present a wand that touches either the left or right target. The handler presents the wand for 7 seconds, then removes the wand and immediately blows a whistle. The whistle is a signal for the dog to touch the pertinent target with his/her snout. If the dog moves at the right time and touches the correct target the dog receives a treat reward. If the dog moves prior to the whistle, does not move, or touches the wrong target the dog does not receive a reward. The fMRI working memory experiment also tests the dogs’ accuracy when there is a longer demand for retention. In the delay repetitions the wand is only presented for 3 seconds, then removed for 7 seconds before the handler blows the whistle. To receive a treat reward, the dog must patiently wait for the whistle before touching a target and must retain the information regarding which target the wand last touched. To view a video of Dog Project volunteer Vick D’Amico training her Golden Retriever Pearl to participate in the fMRI working memory experiment, please click the following link: https://www.dropbox.com/s/ma7izl7bkbwadmm/Pearl%20MRI%20Exp5.mp4?dl=0. The video provides excellent examples of both delay and no-delay trials. Better understanding the domestic canine’s capacity for obtaining, using, and retaining working and spatial information will be valuable in modifying accepted training protocols for pet and working dogs as a whole and for specific dogs that exhibit characteristics that indicate strong or weak memory abilities. For instance, the military has a great interest in understanding IED detection dogs’ abilities to retain working information and to orient themselves spatially while searching an environment for explosives. The Emory-CPT research team plans to scan between 10 to 20 dogs before writing a paper that summarizes the findings. For more information about the Emory-CPT Dog Project or to volunteer you and your dog for the Project, please contact Mark Spivak by email at MarkCPT@aol.com. Johnson, E, Adamo-Villani, N (2010), “A Study of the Effects of Immersion on Short-term Spatial Memory,” Engineering and Technology, 71: 582-587, http://en.wikipedia.org/wiki/Spatial_memory. Passolunghi, M.C., Mammarella, I.C., et al. (2010), “Spatial and visual working memory ability in children with difficulties in arithmetic word problem solving,” European Journal of Cognitive Psychology, 22 (6): 944-963, http://en.wikipedia.org/wiki/Spatial_memory. Peigneux, P, Laureys, S, Fuchs, S, Collette, F, Perrin F, Reggers, J, et al., (2004), “Are Spatial memories strengthened in the human hippocampus during slow wave sleep?” Neuron 44(3):535-545, http://en.wikipedia.org/wiki/Spatial_memory. Ferrara, M, Iaria, G, Tempesta, D, Curcio, G, Moroni, F, Marzano, C, Pacitti, C, (2008), “Sleep to find your way: The role of sleep in the consolidation of memory for navigation in humans,” Hippocampus 18 (8): 844-851, http://en.wikipedia.org/wiki/Spatial_memory. © Mark Spivak and Comprehensive Pet Therapy, Inc., December 2014. All rights reserved.